I frikin love it!! Loretta is the queen of county. The men, metalica? One of the true kings of metal,hard rock two legends like this meet from opposite sides of the street???priceless!! I would have preferred they collaborated with Loretta on an album instead of”Lulu” with Lou Reed. Maybe she’ll cover “Ride The Lightning” on her next one? Just proves again,people love Loretta! Loretta is the greatest singer ever. Love her. They are offensive to my ears. Why were they even there? Because they were playing a show. Because people pay to see them. Just because YOU dont like it doesnt make it no good. Metallica is way more country than Sam Hunt. Now we have the receipt to prove it. In fact, I don’t know how many times when I’ve been listening to our local classical rock station (99.7 The Fox) and I’ve thought, heck, this is more country than the local country stations. I don’t just mean the obvious like Skynyrd. From Zeppelin and the Stones to Tom Petty, classic rock is earthy and real and more country than the metro-urban-pop-whatever on “country” radio now. Some of the Stones best stuff was country or country-rock. Check out the song Country Honk, Honky Tonk Women w/a fiddle solo instead of guitar. It’s on the album Let It Bleed which is just dripping with Country Rock. And how many country/alt-country artists have covered Wild Horses and Dead Flowers. I saw Elizabeth Cook absolutely slay the song Let It Bleed. Until I found SCM, I had left country music for indie rock … My Morning Jacket, Band of Horses, Neko Case, AA Bondy… that’s all I listened to (and Hank 3) from 06-10 because it was way more country than anything on the radio. It was also around that time I started seriously listening to The Rolling Stones. Like Trig eluded to in his article with Metallica, those Indie Rock artists always paid homage to country greats like Loretta, while those on “country” radio couldn’t pick her out of a lineup! Neko Case is solid, I just found her and Thanks A Lot has found its way into many of my country playlists. Well, that was painfully awful. Loretta is a queen, though. She lives in Hurricane Mills. Taking a little poetic license to set up how the members of Metallica “butchered” the song, though it was a very sweet and respectful gesture. Yes, let the record state Hurricane Mills is where she lives. Van Lear Rose was a masterpiece. At the time it came out, country radio as it existed then would not play it. When Johnny Cash dies, he had not been on country radio in years. Only at his death did the worms come out of their holes and start wearing “Cash” t-shirts. Conway Twitty barely got a mention he he died too early. Vern Gosden – who the hell was he? The collective brains of those that get to pick what will get played and what won’t get played and of what’s country and what’s not country wouldn’t fill up half a thimble. A pox on all their houses. Her brother Herman lives there and runs the store. Herman passed away in July 2018. Proves that everybody loves Loretta Lynn she’s the queen of country music.A legend of her own,and She’s Country,the best.Love Ms Loretta!!! Cringe-worthy, but endearing all the same. Love them both. Baddddd cover. They should have just played their one country song (“Mama Said”) and dedicated it to her. You are still the greatest…….and beautiful. whos loreta Linn? Pls esplain. i only listen too Kane Brown. All signs point to “No”. Years back at the EMP opening in Seattle, I spotted Hetfield sitting offstage at a Junior Brown gig, watching first note to last. Different genre and skill set but they do seem to enjoy Music and offer respect in their own way. Hetfield has been a double dare away from making a country record for years now. From Glastonbury 2014, via BBC re Dolly’s show, Even Lars Ulrich, of Saturday night headliners Metallica, planned to take it in. “I’ll have a hangover on Sunday but I want to see The Horrors, The Black Keys and Dolly Parton,” he told The Mirror. So they’ve been paying attention to real country for a while. Ilove all your of your songs. Uou are just beautiful and a beautiful voice. The talent, universal love, and respect for Loretta Lynn crosses all genre. Hope she wins the Grammy this year for her new CD…love it! I’m surprised no one remembers this. I would like to know how Trujillo got connected to roots music in such a significant way. I loved this song and video when it came out back in the day. Also, when will Nickel Creek receive the recognition due a group that was far ahead of its time and berthed Punch Brothers and I’m With Her? I loved nickel creek and I really feel like they get overlooked when it comes to the history of keeping roots music alive. What an incredible song. Nickel Creek was part of my introduction to bluegrass and this is, IMO, one of their best. I know for a fact that she wasn’t there. Very odd. Loretta Lynn is #1 in country!! That was cool of them. They should be playing Dyers Eve as a full band though. It should be a staple. That was priceless. Love Metallica for doing the right thing. She is an icon in her field. Music is music people! From Bach to Five Finger Death Punch, it’s all music. A look at how one feels expressed thru another’s abilities to play music. 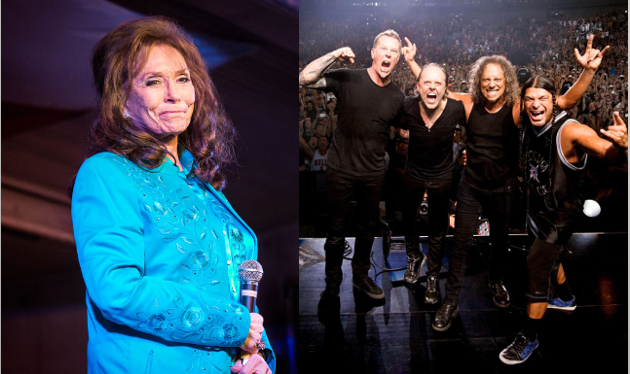 Could you just imagine Loretta Lynn singing Metallic? Awesome! I desperately wish Rob Trujillo and Kirk Hammett would stop butchering great songs in “tribute”. It kinda defeats the purpose of a tribute.First, Prince. Now, Loretta Lynn. That being said, country and metal go together like cheese and crackers, Trigger. Wino and Steve Von Till and Scott Kelly of Neurosis blew Steve Earle’s album of Townes covers out of the water with their Songs of Townes Van Zandt Vol 1. I still consider Rebel Meets Rebel to be an overlooked classic. And Devin Townsend’s Casualties of Cool was among my favorite Country-esque albums of 2014. Not Metallica’s first country legend tribute, they did a live cover of Waylon’s “Don’t Ya Think this Outlaw Bit” a few years back, it’s on YouTube.